The first chore of the day is the best chore: petting Pyrs. Despite what visitors think of my very scary looking and sounding girls, Buffy and Maggie are big cuddlebuckets. They are both rescues from National Great Pry Rescue, and I just adore them. 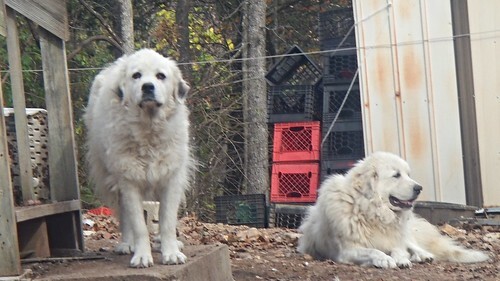 They spend the night barking and on patrol, and are very territorial. When we moved here, our neighbors said there were a dozen or so aggressive strays that had been living in the neighborhood, but they all left after one night of listening to Maggie and Buffy. I was worried my neighbors would complain, but they were so impressed with the strays leaving that they appreciate having them around. 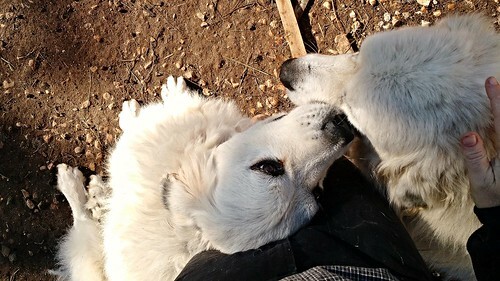 So I go out in the early morning to do the chores, and the first chore is to pet the Pyrs. They have very important dog things to tell me about, and must be cuddled and snuggled and have lots of direct eye contact. If they are all business and don’t want to cuddle, then they have something I need to see, and they will nudge me in the right direction. I steel myself to deal with it, and usually it’s a dead raccoon or fox. They mostly deter critters, but if it comes through the hot wire and won’t leave, they’ll kill it. I put the carcasses on a big compost pile, and the birds and dogs will eventually make it go away. I like to sit on the steps on a calm morning and sip my coffee, eye level with the Prys. They snuggle with me and then play together, so happy. The Icies all go up and say hi to them, too. Morning is a fun, happy time. After a few minutes, I go feed and water everyone else, but I never skip the petting Prys part, even when I’m rushed. They work so hard for all of us, they earn every minute of my time. Sadly, since we don’t have Bjarki anymore, there isn’t much playing between Prys and Icies. This is one of my very favorite videos of Maggie, from long ago and far away.